The backbone of Yang’s platform is a Universal Basic Income, or what he calls the “Freedom Dividend.” Yang says he wants the government to give $1,000 every month to every American over the age of 18. He outlines the policy in his book, “The War on Normal People,” arguing UBI is the most “direct and concrete way” for the government to improve American lives. UBI is hardly a new policy idea, but Yang believes giving people money is especially needed now to combat the growing number of jobs lost to robots and automation. 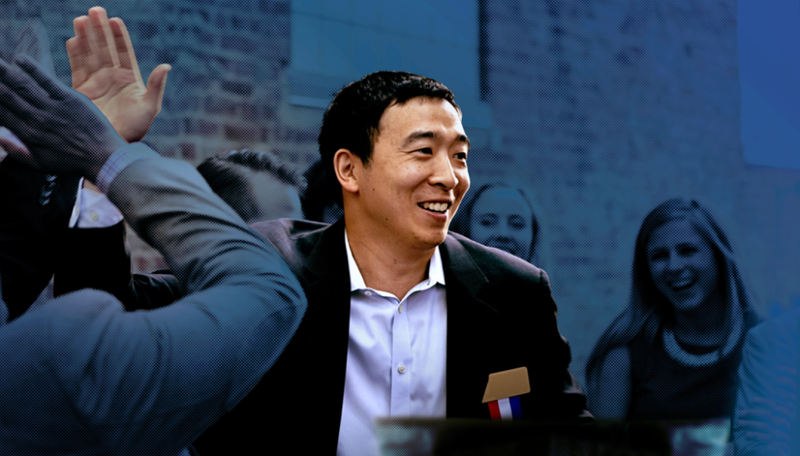 Writing $12,000 checks to Americans every year is an unconventional platform for president, but it’s hardly Yang’s most unique policy proposal. While other candidates like Robert Francis O’Rourke have zero policy ideas fleshed out or even listed on their websites, Yang has something for everyone, from common Democratic positions on health care and education to geoengineering and paying college athletes. It almost seems as if his campaign held brainstorming meeting and decided to publish everything they threw up on the white board. Here are some of the most unique issues Yang says he would address if elected president. “We need to do all we can to find productive uses for the hundreds of American malls that are going to close in the next four years,” Yang writes on his website. He laments the death of American malls that were once hubs of economic activity, but are now closed, abandoned, and often vandalized or inhabited by homeless people. Yang proposes creating incentives and funds to entice developers to reinvent uses for these empty buildings. Arguably one of the most ambitious policy ideas listed on his website is “Making Taxes Fun.” Yang says, “Tax day is dreaded, not celebrated,” and he’s not wrong. Yang proposes making tax day a federal holiday, or “Revenue Day,” and, in an attempt to make it a celebration, Americans should “be able to direct 1% of their taxes to a specific project” to be highlighted and announced as part of the fun. “If someone pays taxes, that’s great and we should make him or her feel like they contributed to important things that make people’s lives better,” he writes. This has to be the most bipartisan issue ever addressed, and Yang apparently detests the out of control robo-calls as much as the rest of us do. He proposes a robo-calling text line, where you can report the phone number of any robo-call that you feel wasted your time. The Federal Communications Commission would then investigate and potentially fine any company that receives numerous complaints. In what Yang calls “Modern Time Banking,” community engagement would be encouraged through an app that tracks and rewards your volunteer hours. You could also reward your neighbors or friends for things like “watering your plants or taking your mail in while you’re away.” Banked time could be redeemed for special experiences like “tickets to a local ball game or meeting with a government or civic leader.” Nope, that doesn’t sound like a dystopian disaster waiting to happen. Yang believes the practice of circumcising an infant is often pushed on parents without proper education about the practice. This is not one of the policy issues addressed on his website, but was reported by The Daily Beast after Yang was asked about the practice on Twitter last week. Yang’s creative approach to solving these problems could be attractive to voters looking for someone with out-of-the-box ideas. But for most the part, his wild proposals seem like more government involvement and increased government-run fixes for things that would be best addressed by either market forces or community members themselves.